(Nanowerk Spotlight) Passive radiative cooling is a process by which objects naturally shed heat in the form of infrared radiation, without consuming energy. While thermal radiation provides some natural nighttime cooling, daytime cooling has been more of a challenge (since even small amounts of directly-absorbed solar energy is enough to negate passive radiation). Recently developed concepts in photonic designs and meta- and nanomaterials have improved the effectiveness of passive radiative coolers that function in the daytime (see for instance: "New metamaterial can cool roofs, structures with zero energy consumption" and "Self-cooling solar cells boost power, last longer"). 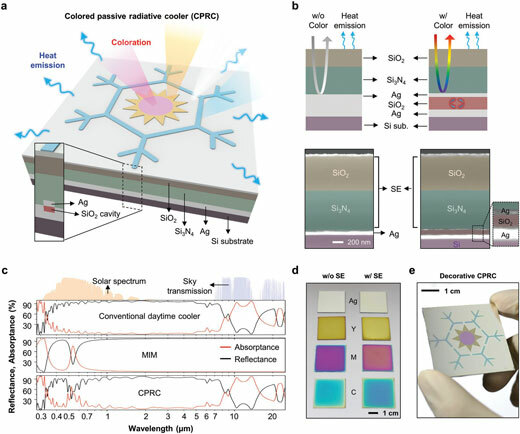 "Because all of the successful examples of daytime radiative coolers possess high solar reflectivity, they are white or silver in color and are thus not visually appealing, thereby restricting the possible installation locations and limiting their net cooling capacity," Young Min Song, an Associate Professor at Gwangju Institute of Science and Technology, tells Nanowerk. "In our recent work, we present concepts and strategies for daytime radiative cooling systems that involve comparable attention to engineering design but with the goal of achieving systems that offer aesthetically desirable colors and patterns and functional purposes." Song and his group from the Flexible OptoElectronics Lab have published their findings in Advanced Optical Materials ("Colored, Daytime Radiative Coolers with Thin-Film Resonators for Aesthetic Purposes"). 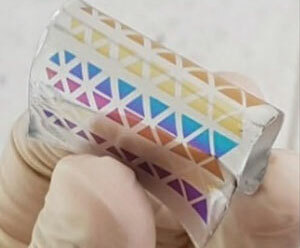 "In the past few years, our group has focused on thin-film photonics including color filters, anti reflective films, highly transparent windows, and transparent electrodes," Song recounts. "When we investigated research reports on passive radiative coolers, we immediately realized that all of these structures are not practical due to their limited color representation. So, we developed the idea of colored radiative coolers." In what appears to be the first experimental demonstration of daytime colored passive radiative cooler (CPRC), the researchers' device not only emits infrared waves effectively under a clear sky, but also displays vivid colors. Residential and commercial buildings are a key focus for this approach but it can also address application concepts for wearable electronics and other temperature-sensitive electronic devices whose operational temperature is lowered by radiative cooling. Device fabrication is based on a photonic approach in which a color film (exhibiting the subtractive primary colors cyan, magenta, and yellow) comprising a metal–insulator–metal (MIM) structure is embedded beneath a highly effective thermal emitter layer composed of Si3N4 and SiO2. Wearable electronic devices will benefit from CPRC because effective heat dissipation will improve battery performance and help prevent thermal damage which could lead to a deterioration in functionality. "In this current stage of our research we showed that our radiative coolers could lower the temperature of electronic devices in its operation state," Song concludes. "For practical applications, the next step will be continuous measurement of battery efficiency of electronic devices with our passive cooler. Another direction will be extensive outdoor testing for building installation."